This week — Thursday, July 21, to be precise — marks the 100th anniversary of Marshall McLuhan’s birth. Here are some thoughts on the man and his legacy. This entry was posted in Uncategorized on July 18, 2011 by Nick. Thanks for linking to the video clip. I found it interesting. Marlantes tries to define the ‘programming’ differences between a warrior on the one hand, and a law enforcement trained professional on the other hand. The difficulty of using an individual trained for one, in a situation, which aught to be dealt with by the other. I find that resonates somewhat, with Mailer’s comments on the man who is alienated. That he is good and bad at the same time. It is only in situations where you are thrown into, where you have no control, that all of that past bad training, in the upper parts of the brain gets left behind. But obviously, Marlantes speaking thirty years later about his experience in Vietnam, trying to analyse it, makes a point perhaps in contradiction of that by Mailer. What is also resonant about the Mailer, McLuhan discussion with the Matterhorn author, is one funny situation that Marlantes described of finding himself in an independent bookstore at Berkeley recently – where he expected to find a very hostile reception. Instead, Marlantes thought it was an example of how fiction can be used to offer the person a kind of experience different from their own. That is, the veteran piece protesters who had hurled so much abuse at Marlantes thirty years earlier when he was a young marine returning, now could use the work of fiction as a starting point from which to discuss an entirely larger subject, and the history. Of course, that somewhat resonates again, with what McLuhan and Mailer were trying to describe about the verb ‘to travel’, coming from travaillier in French, which means to work. BoH. Thanks for this video – what a find! 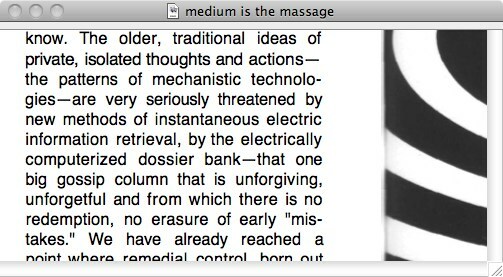 I’ve just discovered McLuhan in the past year or so, and have become fascinated with his work. I’ve seen his name popping up again and again, first in the writings of Neil Postman, then in James Gleick’s The Information and now on countless blogs and websites as we honor his 100th birthday.